The first new product is a recreation of one of the original Star Wars droids, R2-D2. Just like in the films, it can switch from bipod to tripod stances, and even waddle around. R2's signature front and rear lights are fully functional, and it can interact with other Sphero app-enabled droids. It's slightly taller than the BB-8 toy (accurate to the films), and is priced at $179.99. The other new droid is BB-9E, which appears to be a First Order version of BB-8. It has the signature dark and gray design used by The Empire and First Order, with a concave red eye in the place of BB-8's sphere eye. Sphero says it has an ultra-durable shell, and the same LEDs and movement as the droid will have in The Last Jedi. Otherwise, it's functionally identical to the BB-8 toy, and will cost $149.99. 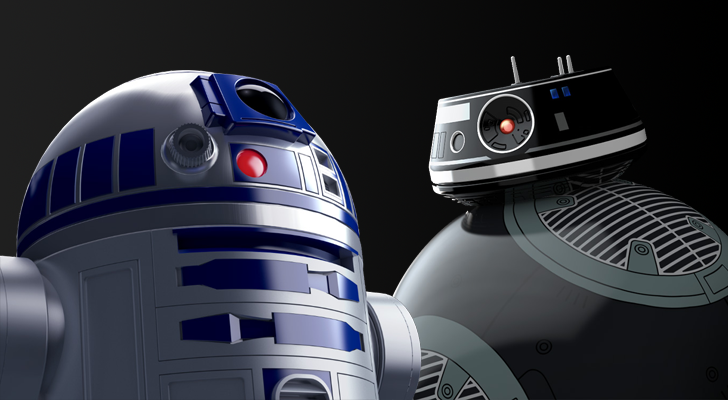 Both droids go on on sale September 1, as part of Disney's Force Friday II festivities. I fully expect both toys to have stock problems from now until Christmas, especially once The Last Jedi is released in theaters.